The perfect First Easter basket for your man. Handcrafted blue felt with a white bunny applique, cotton-tailed Peter bunny is sporting a polka dot blue bow tie and is ready to celebrate Easter. Round felt basket, felt handle, felt applique bunny. 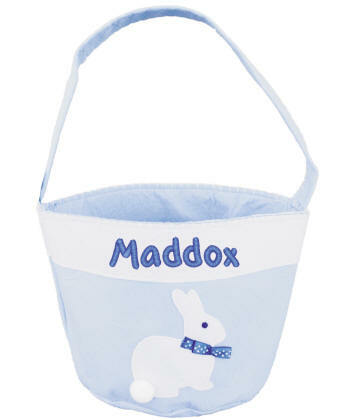 Fill with treats for the perfect Easter egg hunt basket. Basket is 7 in. high (excluding the handle). The base is approximately 7 in x 7 in.